Here's the good news. A diet that's healthy for diabetics is healthy for all the rest of us, too! Fix-It and Forget-It Diabetic Cookbook is packed with delicious recipes for everyone - including those who have to keep track of food exchanges, carbohydrates, sugars, calories, and fats. This cookbook makes mealtime an occasion when everyone belongs. No one has to pass up a dish when the recipes come from this new cookbook in the much-loved Fix-It and Forget-It slow-cooker series. Diabetes, that dreaded disease, has moved into many of our families and households. There are more than 20 million diabetics in the United States. We may not understand diabetes in all its details, but we do know that what we eat affects how diabetes behaves. Each recipe comes complete with its Exchange Value, and with its Basic Nutritional Values. And each recipe emphasizes good nutritional health - whether you are cooking for someone with diabetes or not. 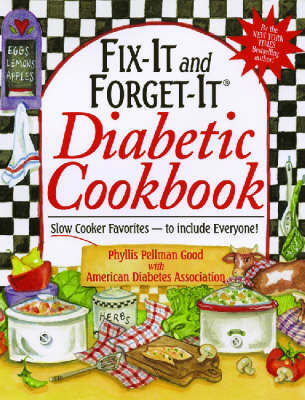 Everyone can eat and enjoy it when you use recipes from Fix-It and Forget-It Diabetic Cookbook.